Drummers are essential to any musical group. They command the rhythm and speed of a song and lay a foundation for other musicians to build on. Starting drum lessons, especially at a young age, empowers and inspires our next generation of musicians in a unique, fun, and energetic way. Though drummers might not be the star of the show, tucked away behind the rest of the band, the sound they make and their influence over the music is powerful. It’s impossible to describe how it feels to sit behind a drum kit. We teach private, in-home drum lessons to students of all ages and skill levels in Falls Church, VA, and the surrounding area. We offer passionate drumming instructors with real-world gigging experience to help prepare students for a career in music. The drums offer a fun and stimulating introduction to music. Our drum teachers help students become talented drummers while also developing critical life skills that will help them in their journey with music and whatever else life throws at them. Drummers need to have skills like communication, confidence, and above all - teamwork. Because other instruments rely so heavily on the drums, being able to communicate well and integrate with any group is a critical skill that transcends drumming itself. Our mission is to give our students a well-rounded music education that prepares them for a career with music whether professional or a life-long hobby. Simultaneously, we aim to develop the whole child by teaching transferable skills and values. And you can get your child started today with zero-risk! We offer interested parents a risk-free trial lesson. All you have to do to start lessons is click the button below to claim and schedule it. If your child doesn’t absolutely love the experience, you don’t pay a thing. No questions asked. The drums have contributed to the making of music for generations. Lending their power to a variety of musical styles across cultures, many different kinds of people have found themselves drawn to percussion instruments. 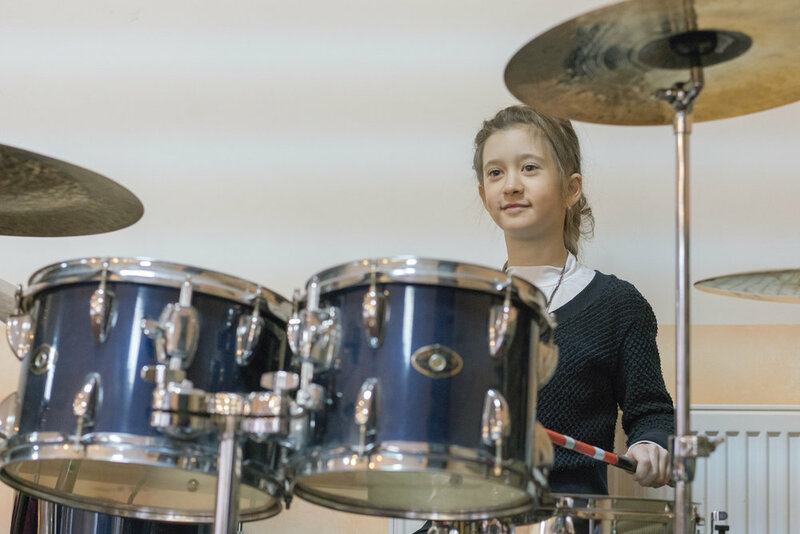 Whether your child wants to play jazz-drums, rock-and-roll, or anything at all, our teachers can refine their skills with the music that they enjoy playing. We aim to be a new kind of music school that tries to disrupt a common cycle when students begin playing an instrument. It starts with genuine excitement and enthusiasm, goes through a “honeymoon” phase, and eventually turns into drudgery, regret, and abandonment. We break the cycle by keeping our students engaged in their practices by focusing on the music that they love to play. There’s no right or wrong way to learn the drums, and there’s just no reason we can’t teach both fundamental and advanced skills within the style of drumming that motivates them. Another way we stand out as Falls Church’s number one music school is by teaching lessons in our student’s homes. We believe this removes every barrier between a child and a well-rounded music education by offering parents the ultimate convenience. It can be tough trying to juggle a busy schedule and your child’s various after-school activities. We offer flexible scheduling to meet your unique needs, and more importantly, our teachers do all the driving. With no hassle at all, you can give your child an experience with music that will reward them for a lifetime. And you can get started with zero-risk. Just claim your risk-free trial lesson today, and we’ll schedule your child’s first lesson with one of our instructors as soon as you are available. If you don’t believe for any reason that drum lessons are right for you, you don’t pay a dime.